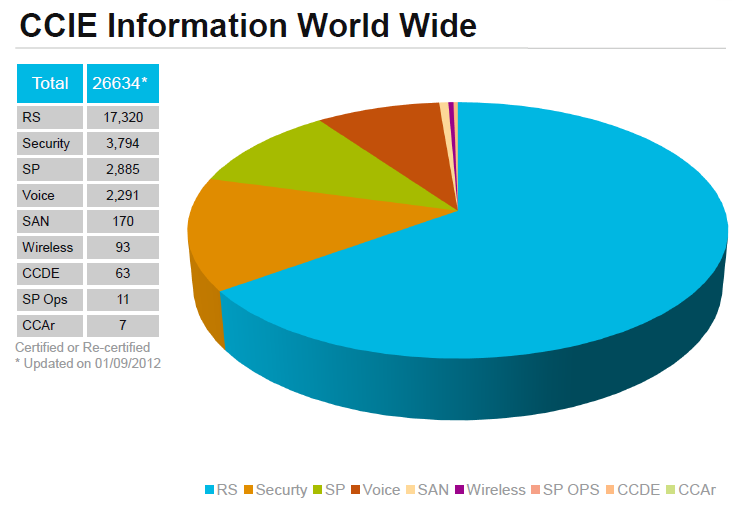 CCIE count worldwide, How many CCIEs ? How many CCIEs are in the world ? Since Cisco is now not publish these stats at regularly (as they did in the past) It is very hard to find accurate answer to this. Also you can find more analytical statistics from the below blog posts. There are less than 100 people certified as Wireless CCIE in the world as of Jan 2012 (I would imagine it is around 150-200 now, but no official information). This is after 3 years of time introducing this CCIE wireless track & it shows how hard to become a CCIE wireless. Again these low numbers keep me motivate to achieve this certification knowing it is a real challenge for me. How about you ? Be focus & Keep studying. Update as of 27th June 2013. Cisco has given an updated figure during one of CiscoLive US -2013 presentation. Interestingly as per this wireless CCIE count has dropped which I could not believe. 1. Wireless CCIE count declining ? all the best for your lab. Any latest update on why sudden burst in number of CCIEs? No idea, these numbers are not published anywhere now..
Ha sorry just realised you were already referencing that :).